What would “The Matrix” look like now? That movie came out in March of 1999 with an R rating. It was therefore targeting folks born in the early 1980s or earlier. A demographic that grew up with the popular image of computers – at least very large ones – as having “green screen” interfaces. Despite the proliferation of WIMP GUIs in the 90s, the classic terminal screen was still a common paradigm when discussing computers. It is also useful to remember that the web was only a few years old in popular culture when this movie was being designed – which probably started in the 1996-1997 timeframe. A time when 56K dial-up was the common smokin’-fast access to relatively simplistic web sites. 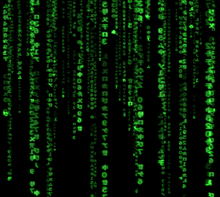 So, the iconic visualization of “The Matrix” as a big cascade of green characters makes a great deal of sense. A cloud. With lightening. And maybe some colors. Video game – the guys watching would be like watching Call of Duty or Battlefield. So, there you go. Of course, by the time the inevitable remake/sequel/reboot comes along, I’m sure we’ll have even cooler paradigms.